The first time Grammy Award-winning mezzo-soprano Sasha Cooke sang Poème de l’amour et de la mer, Op. 19, tears ran down her face. “I used to have to struggle to not cry in music because, especially this piece, it’s so emotive, sensual and incredibly romantic,” Cooke said. That was about 10 years ago, and she was just getting her start in New York. Since then, Cooke has learned not only how to keep her emotions in check, but also how to make a deal. 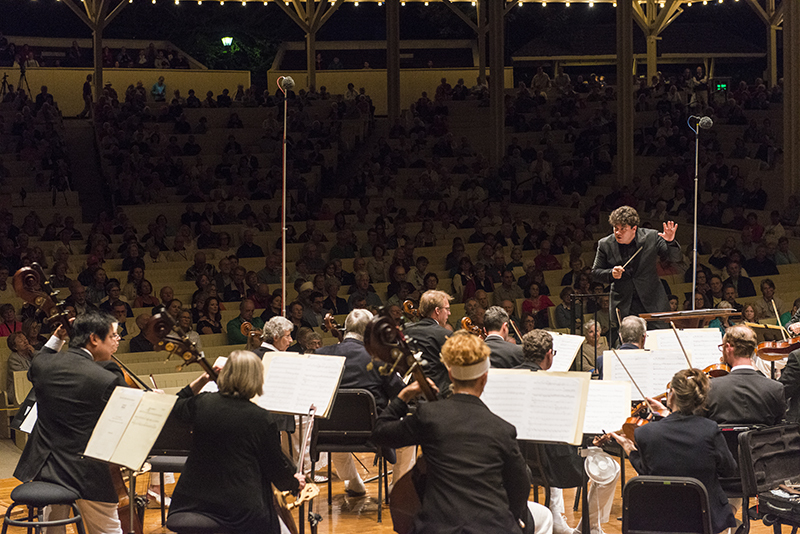 Cooke — who now has an agent — will try not to cry onstage at 8:15 p.m. tonight in the Amphitheater alongside guest conductor Cristian Macelaru in the final Chautauqua Symphony Orchestra concert of the season. The program is filled out with Ottorino Respighi’s “Fountains of Rome” and Sibelius’ Symphony No. 1 in E minor, Op. 39. The piece Cooke sings tonight, a work of French composer Ernest Chausson, falls into her profile as a longtime Francophile. As a 10-year-old growing up in College Station, Texas, she wore a beret and even composed a play in French using a dictionary. She might not remember what the play was about, but the obsession with French music and the Parisian lifestyle never waned as she matured. “I really wanted to be in a cafe, smoking a cigarette,” she said. That beauty Cooke finds in all things French is the same beauty Macelaru, the guest conductor, sees in Chautauqua. When he thought about what pieces to select, it seemed only natural to choose music that reflected the environment. Returning to the Chausson 10 years after first discovering it, Cooke recognizes how much she has matured. Rather than solely practicing, performing and improving herself, Cooke said her life revolves around her budding family rather than just the music — a shift with very few downsides, she said. That’s not to say her career has slowed down much. Cooke still darts from place to place, performing in various concert halls — she said one of the best things about her home in Texas is the proximity to the airport. While she loves performing, she said her career has its tradeoffs. At the end of the day, Cooke said what she really enjoys is the rare opportunity to practice at home. “To be home, in my own bed, at my own piano, making a cup of tea and working on music — to me that is luxurious,” she said.